My sleepovers are epic. (Yes, to clarify I said ARE and not WERE.) First of all, the pizza to person ratio is perfect (2:1 pizza) and second of all, we always play the best games. Just this past weekend we had a pretty dope Skyrim marathon where we took turns playing as a khajiit named Chester Cheetah. (He gave new meaning to the phrase “dangerously cheesy.”) Although I’ll admit, there was just one thing missing (no, not adult supervision, smarty pants! ): a crazy pillow fight. But we all agreed that it’s hard to take battle cries seriously when someone is flinging a Little Mermaid pillow case at your face and so we decided to skip it this time. 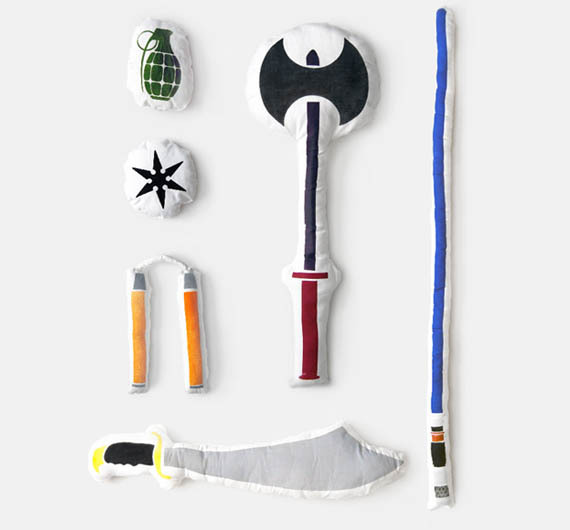 But I’ll be ready for the next sleepover thanks to these amazing pillow fight weapons. There’s something for everyone: a battle axe, grenade, ninja star, nun-chucks, sword and last but not least, a lightsaber. can you buy these things? because if so i REALLY want/need some. like, now. @jacob C – No, unfortunately they’re just a concept by graphic design student Bryan Ku. HAHAHAHAHA too bad they’re not for sale anywhere. i loved the nunchaku especially HAHAHA you could like choke someone with that 😀 this is hilarious. you can never be too old for pillow fights.. unless you’re like 70 or something, then it’s a bit tough on the bones and stuff.. but anyways, awesome stuff! Unfortunately they aren’t for sale. They were created by artist Bryan Ku. If you click the “check it out” link you’ll be taken to his website. He would make a killing selling these!!! I’d buy 2 sets for my house and some for presents!